We are never the whole story. The Sheds provide one piece in the jigsaw of meeting people’s needs in a local community. We need to be part of the bigger picture and understand what else is going on that may be a jigsaw piece that fits with us. Watch the video compilation for all the projects in the Den here. The Dragon’s Den last night had 5 charities pitching. Superficially different but at their heart precisely the same and tapping into different ways of doing that. We all got our money in a very, very fair assessment of organisations needs. Our “guaranteed” £2500 grew to £4000 for SAMS. We have no overheads of employment which means that money goes a long way. We met Whitby Interactive who are 20 years of age and work with families having toddlers to teens with disability needs of different types. We had never heard of them! To be fair, they had never heard of us either. There is potential for the two organisations to assist each other, we believe. Also a Furniture project in Scarborough who are to call in because they can see a fit with us (but maybe Sheds in Scarborough, of course). It was a great night facilitated by combined contributions of effort and some oiling cash. But a genuine sense of committed people with the same objective and a real willingness to know what else is going on. Us, Us, Us not Me, Me, Me at the organisation level. This is a link to the Two Ridings CF newsletter and their account of the evening with info on the Dragons! And here is Two Ridings Community Foundation’s fresh new logo! 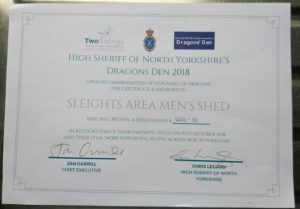 We are expecting some visits in the not too distant future that will also benefit the goals of the UK Men’s Shed Association. There will be a photo here of all those involved but pleasingly mixed up. We will also be getting our part of the video that was shown. Now to the Royal Voluntary Service. It is a very much transformed service from what I knew of WRVS and meals on wheels and hospital services. They are now much more strategic and enabling of others. We received a Shed grant from them and Asda. Often it is people and not organisations that are easiest to get alongside. We met Samantha (see below) nearly a year ago at the Do It! event run with our friends Totally Socially. She lives in Filey and would love to see a Shed there. Samantha is typical of the easy relationships that can be made when a common ethos is shared! Trust, trust, trust :-). It was nice to see you the other week at The Festival of Thrift. Hope that you are keeping well. You mentioned having a line or so of information about the Royal Voluntary Service. I have included a paragraph below that you could use, or you can use the first couple of lines. If these are not appropriate let me know and I can find something else. Royal Voluntary Service provides practical solutions to help older people live better lives, where they feel safer, happier, healthier and more connected. We believe that, with support, local communities and older people themselves can put in place their own solutions to tackling loneliness and isolation and enabling people to live a happier older age. Group and social activities are particularly helpful in enabling older people to develop friendships, provide companionship, emotional support, information and the opportunity to share and develop new skills and interests. 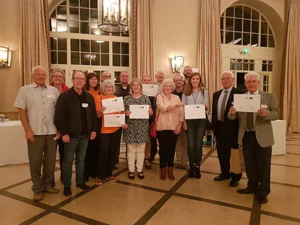 Whether you have a passion for dancing, darts or walking – or are skilled in painting, pottery or making lovely puddings – if you are interested in setting up a new group in your community to share your passion and skills with others, then we are here to help.